Recovering Working Mom: When life hands you lemons, make lemon cupcakes! My Family Fun Shenanigans have apparently inspired some of my friends to embrace their inner creativity. So, I decided to post other people's family fun on the blog today. If you've got a great family fun suggestion, please send it to me. I'd love to post it! Following is a story from my friend Laura who also has her own all girl Trifecta. The difference is that hers are 5 years older than mine, so now I know what to look forward to (i.e. when your make-up somehow disappears, hair supplies are no longer your own, or when boys come to your door with roses and ask your child to homecoming – EEEK!). My goal throughout this experience is not about being environmentally friendly, but rather making my life easier. How long can I go before I have to wash dishes in the bathroom sink? Tonight's dinner consists of kabobs, salad, and lemon cupcakes- all made on the grill. I even managed to not drip any batter on the cupcake pan because that would mean I would have to wash it. 1) At first you can look on the bright side of a flood in your kitchen (new cabinets, granite countertops, new flooring), and then 8 blowers and 2 dehumidifiers arrive. You then realize that you are living on a tarmac with jet engines running 24/7. The kicker - you cannot find anything because you packed them in boxes so quickly that you forgot to label the boxes. CRAP! 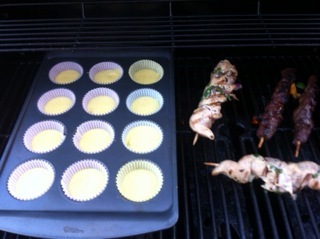 2) Grilled cupcakes are delicious so long as you eat them while warm. Once they cool off they will become hockey pucks; that is, until one of the hockey pucks hits the pool! 3) Make sure that your Costco membership is current. It’s just easier to take the family to Costco for a “samples” dinner. 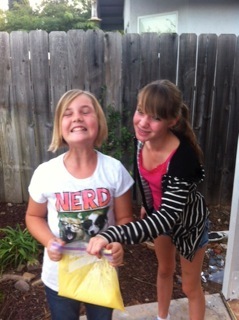 1) Put the mix and ingredients in a gallon size ZipLoc Bag. Enlist the children to squish the ingredients around until moist. 2) Turn the grill on low and follow the baking instructions. Cook for about 28 minutes until golden brown. 3) IMPORTANT - Frost and eat while still warm! If you have any creative grilling suggestions, please comment. Laura’s got a long way to go on her grilling journey.